I remember the last time I ever saw her. A piece of hair had fallen across her green eyes. The ends brushed her lashes and she blinked once, hard. Her lips trembled. Her hands, with thin wrists and red, raw knuckles, held a thin black phone to her ear. She was calling a friend who would never answer the phone. She stood, tense, her weight firmly on both feet, ready to run. Ready to fly. Desperation is written into every line of her body, which is shaking like a leaf. I can see the red welt on her cheekbone, swollen hot and painful. Gold sunlight from the window behind her pushes, breaks, shoves, its was through her hair, illuminating faint freckles on her nose. 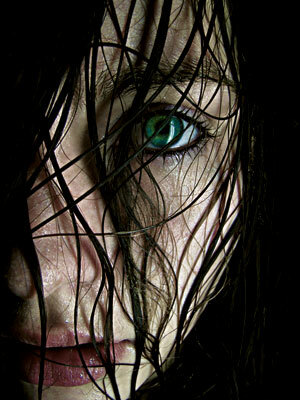 Her eyes meet mine, they are a dark green, inky color, made of smoke and sadness. I feel my head move, a silent no. No, your friend will not answer the phone. He is gone. Gone because he belongs no longer to the world of light and air and laughter. He belongs to the worms and dirt and some awful netherworld of rot. I see the denial in her eyes. No, he can't be. The thin black phone falls from her hands, shattering into a million pieces on the hard floor. The sound practically explodes in the silent theater. Her shaking hands fly to her mouth, which is wide in a silent groan of pain and grief. I watch worlds, universes collapse in her eyes. Her knees almost give way. Her weight shifts, flinching back, her head, her body screaming no no no he can't be gone. I see the subtleties of agony in her face, the flaring of nostrils and the twitching jaw muscle. And then there is a blur of movement and she is gone, leaving dust motes swirling in her wake. I feel myself howl. Eliot said we'd go with a whimper but this sure as hell feels like bang. I feel my knees hit the hard, tired wood of the stage. My face is taut, bitter tears streaming down my face as I scream my throat raw. I claw at my clothing, causing deep scratches where I miss cloth. I wrap my arms around myself, physically holding myself together, otherwise I might just disintegrate, fall into the earth. I can feel the hole where she was. I feel it in my bones. There is more of her in my veins than blood. I feel her sear across every inch of my skin. At some point, I run after her into the rain-washed street. I screech her name. But there is no answer and I can feel the hollowness of the gray, gray street. My veins feel as though they are being chiseled, my eyes feel too big for my sockets. I fall to my knees and pound the rough concrete. Why? I'm asking, screaming to the sky and God and the ground and the smell of stale alcohol. This is about my...someone I once loved. Her best friend died from cancer on that day, and she disappeared. Just picked up and left town. I looked for her for one whole year. I never found her, never saw her again. I miss her still.